Ecologist Peter Ballin hands out material as Karen and Arne Raven (standing on right) look on. The first "Nan's Weekend' in Canada took place June 7-9, 2002 on the Wolf Ranch near Pritchard, B.C. Enthusiastic participants declared it an unqualified success. 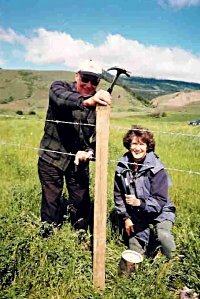 The concept of "Nan's Weekend" originated eight years ago in Oregon on the Prineville ranch of John and Lynne Breese as a tribute to their late friend Nan, a teacher and problem solver. It has become an annual event there. City and country folk mingle with people from the natural resources fields. 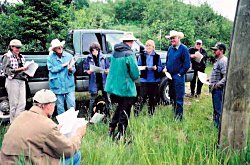 Discussions Of biodiversity and grassland conservation are leavened with hands-on ranch work. The process merges theory and practice. All ages are welcome. The main qualifications are an open mind and willingness to learn from one another. The goal is to further public understanding of the complexities of rangeland management and find innovative solutions to conservation dilemmas. This networking mirrors the philosophy of Wolf Ranch manager Arne Raven and his daughter Karen, who believe that no one has all the answers and that people who are not experts can still make important contributions. Their guest list reflected this belief in human diversity. Professions of those attending included; ranch worker, student (college and grade school), writer, accountant, Professor of Ecology, housewife, nurse , and Professional Agrologist. Fellow ranchers came, as did visitors from Denmark. People with years of experience in resource management worked with someone who "just knew she liked nature". First Nations representatives, who couldn't attend the day sessions, dropped in for the Saturday night barbeque and their children slept over. 'Nan's Weekend' continued the Wolf Ranch tradition of blending conservation and public education with daily ranch management. Arne is proud that curlews, emblems of the Grasslands Conservancy, mate and nest on his ranchland. For years the Wolf Ranch has co-operated with the Kamloops Naturalist Club to provide nest box sites for bluebirds and worked with the South Thompson Watershed Committee to replant riparian zones. The Nan's Weekend experience was fascinating to anyone who's been to one too many land planning meetings. As everyone knows, people work better after a good breakfast. Getting acquainted over pancakes and bacon created a much more harmonious mood than glancing warily around a boardroom table sizing up competing agendas. The first project was practical, to fence in a stock watering pond and plant willow, hawthorn and cottonwood around it, making it more attractive as habitat for water fowl and upland birds. Arne and Karen's plan was to give them cover and provide a staging area - a 'rest and recreation' spot Arne calls it- for migrating birds, as well as offering nest sites for ducks. Cattle will be allowed in to graze at times not conflicting with nesting and hatching. We were driven to the pond, almost a small lake, really, and handed our tools, Fence markers, wire and hammers for some; buckets of trees, rows of tree collars and shovels for others. With no pre-arrangement people grouped into teams. As they watered trees or marked off fence measurements together, barriers between strangers vanished. By lunch a sturdy fence enclosed well -spaced dots of green. After consultation with Arne, a viewing area near the road was left unplanted so that passers-by could enjoy the lake and its wild inhabitants. During lunch, Karen McLaren, Chair of the Kamloops Naturalist Club Bluebird Committee, gave a history of the mountain bluebird trails around Kamloops where bluebird nest boxes are set up and regularly monitored by the Club. Karen's own bluebird route is on Wolf Ranch land. The project, begun in l980, replaces diminishing natural nest cavities. "Between logging and development, there aren't a lot of old trees and their nest cavities available any more." Said Karen. Many ranches co-operate with the bluebird group in a mutually beneficial arrangement. Bluebirds devour insects, grasshoppers particularly, which do direct damage to hay crops. Bird numbers are increasing, a credit to the far-sighted ranching community and the determined naturalists. It was appropriate, that the next session was held on some of the forested land belonging to the Wolf Ranch. Ecologist Peter Ballin spoke of the place of death in the forest. Forested ecosystems, he said, depend on the death and decay of trees. In fact tree death may rival tree life for promoting biodiversity. Thirteen percent of forest dwelling vertebrates and five percent of forest dwelling plants are now threatened or endangered mostly due to habitat loss to development. Death as important as life? It was a new concept to most of the group. "Look ,really look, at the forest", Peter urged. People scattered among the trees, searching for nests, hunting perches for hawks, lichen and squirrel middens. They found a totally unexpected bees' nest in a hollow snag. The variety and complexity of life forms and interconnected cycles on what at first glance seemed a simple piece of forest land, was fascinating and enlightening. There were discussions about limited logging which would retain an intact ecosystem. 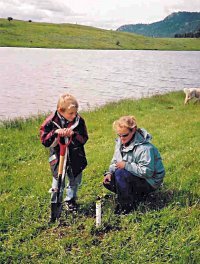 Siobbhan Nesbitt and her nephew plant trees around Nan's Pond. The final session of the day took place on a grass-covered hilltop overlooking the pond. Alf Bawtree, P.Ag. , talked about healthy range land, the place of introduced and native species of grasses, and the problems of such pests as grasshoppers. Crested wheat grass and alfalfa, he noted, are both introduced species, but are ideal for the ranch because they take a lot of grazing. Crested wheat grass matures two weeks earlier than native grasses and is very competitive with weeds such as knapweed. Like bunch grass, it builds humus and organic matter. But, he went on, maybe we should be custodians for native grasses. There was an exchange of idea on the use of pesticides and herbicides. "It is difficult", said Alf, "to manage for both wild and domestic species. Whereas deer are not usually competitive with cattle, elk are direct competitors. But, maybe, under certain circumstances, we want to manage for elk." He welcomed public involvement. "As the general public gets further and further away from agriculture, they fail to understand the damage people can do to ranch land. "Most people, he added", don't realize how slow and difficult it is to change what's there now to something else. So, it's important to be aware of what we'll need down the road. Change takes fifty years." He pointed out that previous degradation of land, such as the overgrazing when horses went wild, takes years to reverse. People thought about these questions while looking down on the newly fenced pond. "Shouldn't that pond have a name?" I asked Arne. He thought for a moment. "Nan's Pond!" he replied with conviction. Of course. From the hill we could see large, round , white objects in the meadow . "Stones" we decided. "Mushrooms." Declared, Bob, the ranch hand. "Mushrooms?" Two of the group are mycologists. Into the trucks! Mushrooms they were, giant puffballs. And, there was more. As we stood admiring the puffballs, a long-billed curlew was spotted, stepping gracefully across the grassland, proof indeed of the welcome given to wildlife on the Wolf Ranch. Discussions about what we'd seen and done continued during dinner and into the evening. Isabel Nanton, a native-born Kenyan, told of conservation problems and successes in that country. Striking a balance between protecting nature while maintaining a productive and financially viable agriculture in the face of increasing human numbers and demands is a world-wide conundrum. People had some last thoughts. Peter pointed out how important it is that instead of seeing just trees, we have a total picture of everything that occurs in a forest and how necessary all the stages are. Alf was very clear. "We don't know much. We have to be damn cautious what we do and look carefully at the impact our actions are having. " Arne echoed that sentiment. "We are temporary stewards of the environment. So, we have to talk and build bridges and be wary of new, untried, ideas." Crystal Dewar summed up the general response to this weekend of learning, activity and camaraderie; "I now look at everything totally differently; with respect and joy."